26-01-2018 – As the calendar marks another January 26, the spotlight is once again focused on the revealing fact that Australia’s national day marks the beginning of an attempted extermination war fought against the indigenous people of this land. The war raged for 150 years, and its legacy remains burned into the very establishment of the imposed capitalism the British Empire spread in the days of its colonial “grandeur”. In many ways the war continues, and Aboriginal people still cop the iron heel of oppression which no amount of “reconciliation” can gloss over. For example, Aboriginal people represent no more than 3% of the total Australian population, yet make up 28% of the prison population. A staggering 48% of juveniles in police custody are Aboriginal. The United States of America was founded on African-American chattel slavery, yet today 0.6% of African-American men and women languish in the notoriously overpopulated US prison system. By contrast, 6.7% of Aboriginal men and women are behind bars in the “wide brown land”. The life expectancy gap between indigenous and non-indigenous people remains at around 10 years, with Aboriginal people perishing, on average, 10 years before non-indigenous people. By the government’s own figures, much greater incidences of circulatory, respiratory, nutritional and endocrine related disease account for most of this, as well as increased rates of cancer. Figures for the rates of indigenous employment are particularly galling. As recently as 2015, less than half (46%) of Aboriginal and Torres Strait Islander people over the age of 15 were employed. The housing conditions for indigenous people, especially in remote areas, are arguably worse than comparable Third World standards. On Palm Island, there is an average of 17 people per household staying or living there, often in only 3 bedroom dwellings. In the Northern Territory (NT), 90% of all homeless people are Aboriginal, and the NT is the location for 60% of all “severely overcrowded dwellings”. The “cashless welfare” trials – first used only on Aboriginal people, where welfare payments are quarantined onto a credit card – directly sets up apartheid like system of open public discrimination. These elements are only a part of the real oppression faced by the first inhabitants of what became Australia, a presence that pre-dated British colonialism by some 60 000 years. White Australia does indeed have a Black history, but one that is continually trampled on – with January 26 as the “national day” representing an open wound. Change the Date or Abolish Australia Day? January 26 marks the first landing of Captain Cook at Sydney Cove in 1788. From that date, the genocide and dispossession of the Aboriginal people began (hence “Invasion Day”). It was not until 1967 that Aboriginal people were officially recognised as part of the Australian population. This stark injustice has been protested by Aboriginal people and their supporters for decades – the first known protests taking place in 1938. Australia was established as a colonial-settler state, but genuinely acknowledging the prior custodianship of the Aboriginal and Torres Strait Islander people would call into question the legitimacy of the Australian nation. Hence, the Australian ruling class attempt to deny this history, while its police and state institutions deal out horrific levels of repression against indigenous people. In recent years, demands to change the date of Australia Day have become louder and louder, prompting the radio station Triple J to cease playing its “Hottest 100” on January 26. 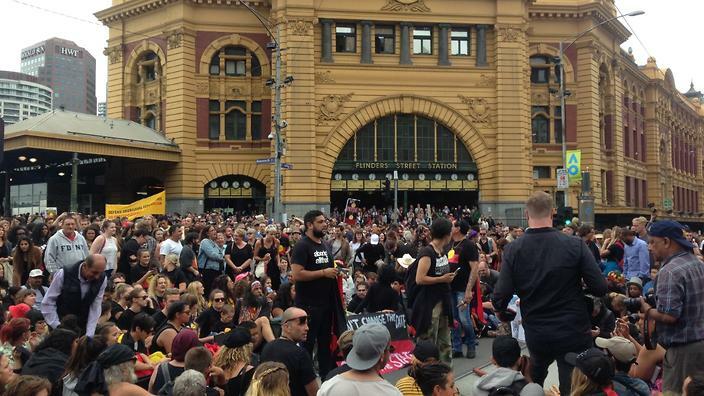 Last year in Melbourne, Invasion Day protests gathered a crowd of 50 000. The Australian Greens have been prominent in supporting demands to change the date of Australia’s national day from January 26 to another day. A Greens Victorian MP, who is herself indigenous, reportedly received death threats for suggesting that the Australian flag should be flown at half-mast on January 26, to recognise that the day is a day of mourning for many Aboriginal people. Struggles to change the date of Australia Day will need to confront and defeat the prevalent racism that has resulted from its colonial history. This year, the Warriors of the Aboriginal Resistance (WAR) have raised the demand “Abolish Australia Day”, seemingly as a counter to the demand to #changethedate. WAR play a tremendous organisational role in facilitating and enabling political action to fight the ongoing injustices perpetrated against Indigenous people. WAR certainly have a point that the “change the date” demand is being backed by some conservative and mainstream elements, who seek to foster a kind of liberal nationalism. The Greens and the ABC funded Triple J are certainly at the forefront of this drive, but it is even backed by some employers. However, while the struggle of the Aboriginal people against their oppression is always progressive, it does not necessarily flow that the politics of the leading Aboriginal groups will follow in this direction. WAR’s political program is that of Aboriginal nationalism. We argue that all nationalisms represent a dead end for working people, and Aboriginal nationalism, especially the separatist variety sometimes given credence by WAR, is also problematic. In asserting their own Aboriginal nationalism, by raising the demand “Abolish Australia Day”, WAR effectively deny the only national identity available to their non-indigenous allies, the most important of which is the multi-racial working class. For workers, neither is Australian nationalism the answer, as the fundamental division, as in all capitalist societies, is between the working class and the ruling (capitalist) class. However, we argue that the demand to change the date of Australia’s national day should be given critical support by working people, only insofar as it represents the wresting of an important concession from the elite who are responsible for the oppression of both the indigenous people and the working people. The support is critical, because it can easily be recognised that liberal and conservative working class opponents (corporations, employers, NGOs, the Greens and even some within the ALP and the LNP) can also come behind this demand – and some already have. Russian revolutionary leader VI Lenin once quipped a nation is “the bourgeoisie together with the proletariat”. This apparently off-hand remark nonetheless exposes all nationalisms as inimical to the interests of working people, in Australia and internationally. Marxists recognise that nations correspond to a particular socio-economic mode of production (capitalism), which came into existence with its rise, but will fade away into irrelevance once it stagnates into decay, to be replaced by a superior and higher mode of production (socialism). Nations are constituted historically, politically and economically, over a period of time. There is no doubt that the Australian nation was founded on barbaric genocide against the Aboriginal people, who were forcibly dispossessed. The profit system was then established on the mainland as well as surrounding islands, on the backs of the exploitation of wage labour. Despite the Aboriginal people not being fully integrated into the working class, through no fault of their own, it is the shared oppression that the Aboriginal people experience alongside Australian workers which is the key to their liberation. This remains the case even as we recognise that the oppression of Aboriginal people is in many ways more substantial than that of working class oppression. The demand to Abolish Australia Day certainly sounds militant, but does not offer a way forward. WAR are correct to imply that simply changing the date of Australia’s national day will do little to address the ongoing issues the Aboriginal people face. We do not critically support a minor reform in order to thereby garner greater support for the Australian nation, much less the billionaire class which rules Australia. On the contrary, we critically support democratic reforms in order to allow the best conditions for the building of working class opposition to capital – the real source of Indigenous and working class oppression. Minor reforms, once achieved, tend to highlight the fact that conditions have not substantially changed, and attention often then turns to more basic aspects of capitalist exploitation. WAR can also refer to indigenous people as “First Nations People”. Through this they imply that the approximately 500 Aboriginal tribes which inhabited what is now known as Australia were actually nations – either already established or in the making. These did occupy certain areas of the continent, and spoke their own languages. But the possibility of an Aboriginal nation – either one single one or five hundred small ones – coming into being through mutual economic exchange and the development of a definite political economy was annihilated by the invading British colonialists, who went on to establish their own nation over the top of the remnants of their brutal conquests. This nation today contains vast inequality, being a component link in the chain of global capitalism, not to speak of being a willing vassal of US imperialism. As such, its economy today is in dire recession, and has been since the onset of the “global” financial crisis in 2008. Unemployment, poverty, homelessness, relentless de-funding of health and education are just some of the inevitable results. What is needed is the overthrow of the rule of capital and the establishing of a workers government, as part of the first rounds fired in struggle for world socialism. Only with workers in power will the long suffering Aboriginal people have a chance to seriously address their intolerable material conditions. In part, WAR does recognise the necessity for working class support, through their various contacts with some Unions. To be sure, it is understandable that some Aboriginal groups may make the error of adopting variations of cultural or black nationalism in the absence of a strong working class and left-wing movement. The chief culprits for this dire state of political affairs, where most younger workers can barely imagine what class struggle looks like, are the conservative and craven careerists of the trade Union bureaucracy, who ideologically defend capitalist rule. With a few exceptions, these well-paid Union careerists have almost totally abandoned the Aboriginal people to their fate – when they should be at least helping to mobilise workers to defend indigenous rights. This manifest misleadership of the Unions is assisted by some left parties, who recognise the betrayal of the Union leaders, but fear a political break with them. In a similar way in which the Black Panther Party in the US was formed as a reaction against the tame liberalism of Martin Luther King, WAR appears to be a militant Aboriginal reaction to the abject lack of Union-led defence of the oppressed people of Australia, and the lack of a strong left-wing workers party. Despite the heroic bravery of the Black Panthers, their black nationalism impeded their political development in the direction of genuine Marxism – despite some adopting off-cuts of Maoism. The Black Panthers were unable, or chose not, to link with the US working class, and thus were eventually eliminated by the murderous police actions of the US state. We sincerely hope that nothing like this will be the fate of WAR, but their adoption of the ideas of Aboriginal and/or cultural nationalism loom as a barrier to forming the necessary bonds with Australian workers. A bridge must be found between the primitive socialism of the Aboriginal tribes and the advanced socialism which supercedes capitalism as a higher mode of production, where advanced technology is used for the purpose of reducing, and eventually eliminating, alienated labour. That bridge is the multi-racial and multi-ethnic Leninist vanguard party, integrating the most class-conscious militants from amongst the Aboriginal, migrant and Australian born working class communities. Such a party will champion Aboriginal liberation as a component part of the socialist revolution which must overturn the rule of the banks, the CEOs, and the stock exchange. The centralised political power of the ruling elite, with its army, its courts, its prisons and civil service must be met by the centralised political power of the working class, despite all manner of its heterogeneous cultures, backgrounds, indigenous and non-indigenous heritage, languages and so on. So long as the majority of Australian workers follow, or cannot articulate an opposition to, conservative Union leaderships, there will be no revolution – and no liberation for Aboriginal people – in this country. A revolutionary workers party is aimed at resolving this crucial issue. Let us build it now. Hands Off Iran! No More Western Backed Regime Change Wars! 03-01-2018 – Like a broken record, the same old regime change rhetoric is being wheeled out once again by the paid and unpaid agents of Western imperialism. In the name of “human rights”, “democracy” and “freedom”, we are once again being softened up for yet another Western backed regime change war – this time on Iran. This follows the catastrophic regime change wars waged by the US Empire and its domestic and international allies on Libya and Syria. Regime change intervention was also attempted by the US Empire in Yemen, Ukraine, Venezuela and the Democratic People’s Republic of Korea (DPRK or “North Korea”). Many of these interventions could have triggered World War III – nuclear Armageddon. It’s a dead giveaway – when “protests” in Iran are backed by US President Donald Trump, Hillary “Destroyer of Worlds” Clinton, the Zionist Israeli state, and the Wahabist Saudi Arabian monarchy, you know they are suspect. When the same celebrities who cheered on arguably the dirtiest imperialist war in history – the six year war on Syria – clamour to cry crocodile tears for “freedom” in Iran, you know something is off. When US Senator John McCain – known for posing in photos with Ukrainian fascists and ISIS mercenaries, and farcical US Ambassador to the United Nations (UN) Nikki Haley – infamous for the absurd claim that the DPRK is “begging for war” – tweet in favour of an alleged democratic uprising, you know the reality must be the opposite. This is of course not the first time that the US has attempted to foment a “colour revolution” in Iran. In 2009, some protesters hit the streets claiming, without a shred of evidence, that the elections which resulted in the re-election of then President Mahmoud Ahmadinejad were fraudulent. The US hailed a “Green Revolution” which, however, did not gain anywhere near majority support amongst Iranian people, and was subdued by the security forces. This time, sources from inside Iran have stated that the protests in Iran over the last week are much smaller than the ones in 2009, and so have even less chance of gaining mass support amongst Iranians. In fact, what have been more or less ignored by the Western corporate media are pro-government demonstrations which have been held, which vastly outnumber the anti-government rallies. Last Saturday, pro-government demonstrations were held in 1200 cities and towns across Iran. These rallies have been held every year since 2009, to demonstrate opposition to attempts by Iran’s international enemies to foment destabilisation. The chances of the current anti-government demonstrations gaining overwhelming support amongst Iranians are miniscule. But that is not the point – their aims are precisely to gain international “assistance” – in the form of a US led regime change war, a la Syria. The parallels with the so-called Libyan “rebels” in 2011 openly calling on NATO to bomb their country are striking. Another clue that Western governments and some of their client states are behind the anti-government protests, is the fact that “economic” demands very quickly became “political” demands. Apparently beginning over concerns about unemployment and inflation, chants have rapidly moved towards a line identical with that of the US deep state designs for the Middle East. Reports have it that some protest chants went: “Let go of Palestine…not for Gaza, not for Lebanon…I’d give my life for (only) Iran.” Without mentioning it, this refers to Iran’s role in preventing the victory of ISIS and Al Qaeda in Syria, along with the assistance of the Lebanese Hezbollah – not to speak of Russia. Iran currently has the permission of the Syrian government to clean up the remnants of ISIS which are still in Syria, and still being backed by the US government, though not openly. If Iran, Russia and Hezbollah had not intervened to help defeat the US funded mercenaries, Iran would almost certainly have been the next target. The Iranian military’s actions were necessary not just for the survival of Syria, but for the survival of Iran itself. Yet the anti-government protestors condemn the Iranian government for possibly even saving their own lives. It should be noted that there are indeed some serious economic problems in Iran, which working people would be justified in protesting about. Reportedly there is 12% unemployment, along with 25% youth unemployment. Economic growth is stagnant, and inflation is pushing up the price of necessary items such as food. Yet in fact, Iran’s Supreme Leader Ayatollah Ali Khamanei has been one who has been vocal in demanding government action about this! The Western supported protestors target Khamanei regardless, giving the game away as to what they are really demanding. What is more, the US led economic sanctions on Iran are to a large degree responsible for some of the poor economic conditions within Iran. And in fact, Iranians arguably have more democratic rights to protest about such things than the citizens of the governments now assaulting them – Israel, Saudi Arabia, and arguably the United States. While the world’s workers need not politically endorse the economic or political actions of the theocratic Iranian government, it is in the interests of the working class to stand by Iran during imperialist attempts to undermine or overthrow its state. In addition, there is a dire need to stand with anti-imperialist and non-imperialist states whose actions are, for the moment, preventing the US and their allies from launching a nuclear holocaust. Such states include Iran, Russia, China, Syria and the DPRK. One system is responsible for the ongoing threat of a global nuclear war, from which much of humanity may not recover. This is the system of capitalist-imperialism. A worker led struggle to uproot this system and replace it with socialism is an urgent task. As part of this, an anti-imperialist anti-war movement must be built to not only demand an end to civilisation threatening wars, but to demand the restoration of basic living standards which the profit system has denied us. HANDS OFF IRAN! West Papua: Can Independence Deliver? 24-12-2017 – To the casual observer it appears to be an open and shut case. An indigenous people are occupied by a superior military power, which attempts to forcibly integrate the inhabitants within the larger and more powerful state, denying national and cultural rights that all people should enjoy. The oppressing power installs settlers in the occupied region, who, over time, come to overwhelm the original inhabitants. This power enjoys the backing of the “advanced” First World powers, which supply it with political and diplomatic support, along with state of the art military hardware. In response, the international left backs a movement for independence, linking with the domestic leaders, while applying political pressure to “their own” wealthy but rapacious governments. It all sounds straightforward. But in the case of the independence movement for West Papua, as in many things political, issues are not all what they seem. Progressive minded folk might object – but isn’t it a re-run of the situation of East Timor, where we have an obligation to back an independence movement? In fact, while not ignoring some similiarities, there are several reasons why the situation of West Papua differs significantly. Firstly, East Timor was militarily invaded by Indonesia in December 1975, days after a declaration of independence was made following the withdrawal of the former colonial power Portugal. The Indonesian military occupied East Timor from 1975 until 1999, when a United Nations (UN) sponsored referendum resulted in an overwhelming vote in favour of independence. Pro-Indonesian militias then embarked on a rampage, slaughtering around 1400 people, and pushing hundreds of thousands into West Timor as refugees. A UN badged INTERFET (International Force for East Timor) Force was sent in, which had the effect of preventing further violence. Although the exact role of the UN and the Australian military forces in East Timor at the time was dubious, East Timor was recognised as an independent nation in 2002. This military invasion and occupation of East Timor in 1975 was not recognised by the UN, not backed internationally, and in reality only the Australian government openly sided with Indonesia. In the case of West Papua, there was no overt military invasion, though Indonesian rule in West Papua came about in deceitful circumstances. The western part of Papua New Guinea was once a Dutch colony, but the Netherlands prepared for withdrawal during the 1950s. In 1961, West Papuans first raised the “morning star” flag, and sentiment for independence began. However, Indonesia soon asserted what it believed to be its sovereign rights over the area, and a conflict broke out with the Dutch and indigenous West Papuans. In 1962, a UN sponsored treaty known as the “New York Agreement” was drawn up, which appointed Indonesia the temporary administrator. The agreement included a clause of which the intent was that all West Papuans would be able to vote in a referendum on independence. Unfortunately, when this referendum was held, the Indonesian military held 1026 West Papuans at gunpoint, and threatened themselves and their families with elimination if they voted for independence. This so-called “Act of Free Choice” was approved by the UN, despite the circumstances, and this remained in place for decades afterwards. 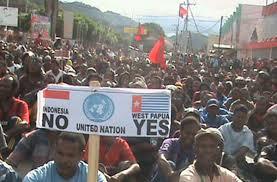 West Papuans dub it the “Act of No Choice”, and it forms one of the planks of independence sentiment today. There are also significant differences between East Timor and West Papua in relation to Indonesia’s long running transmigration program. The Indonesian government claims that transmigration is a necessity to alleviate population pressures on the densely populated islands such as Java, Bali and Madura, and assisting the development of outer areas such as Kalimantan, Timor and West Papua. There seems to be credence in critiques of transmigration from some groups, which claim that transmigration in Indonesia has barely alleviated the population pressures at all, and has led to significant environmental damage through forest and land clearing. Despite this, it has had the financial backing of the World Bank and the Asian Development Bank throughout the 80s and 90s. Many West Papuans see the Indonesian government’s transmigration program as an attempt to outnumber them over time, to make them a minority in their own land. There is some justification in this view, as there are many reports of the Indonesian government backing transmigrants that identify their traditional lands as suitable for settlement, clear the forests, and then give indigenous West Papuans the “choice” to live in a transmigration settlement area as a minority. This understandably fuels antagonism towards the Indonesian government and the transmigrants themselves, and fosters further sentiment for independence. The sheer numbers are vastly different though, between West Papua and East Timor. A research paper by Dr Jim Elmslie, a specialist in West Papua studies at the University of Sydney, estimates that the current non-Papuan population in West Papua now comprises 51.27%, or around 1.8 million, whereas the Papuan component comprises 48.73%, or around 1.7 million. This is incomparable to the situation four decades ago, where Papuans made up 96.09% of the total population. This is the “slow motion genocide” West Papuan independence supporters refer to. The transmigration issue for East Timor, on the other hand, was not in the same league. While there was transmigration into East Timor, it was at a significantly lower rate, and by no means ever attained a majority. On the contrary, it is estimated that between 1970 and 1990, the non-Timorese population in Timor (mainly comprising Indonesian, Chinese and Portuguese descendants) rose from 1.6% to 8.5%. Thus, at the time of the UN sponsored referendum on independence in East Timor in 1999, the non-Timorese population in East Timor would presumably have not exceeded even 10% of the total. This 10% was excluded from the vote in 1999, where over 80% of the people of East Timor voted for independence. In August this year, West Papuan independence activists delivered a petition to the United Nations in Geneva, symbolically swimming across Lake Geneva to present it. Exiled West Papuan independence identity Benny Wenda stated that the petition had been signed by 1 804 421 people, which was comprised of 1 708 167 indigenous Papuans and 96 254 Indonesian settlers. Dr Jim Elmslie estimates that this represents 70.88% of the indigenous Papuan population. Reportedly, hard copies of the petition were smuggled from area to area in West Papua after the Indonesian government blocked its distribution online. The petition and its dramatic submission certainly attracted worldwide attention, but it also raises a potential problem for the West Papuan independence movement. What way would the other half of the population of West Papua vote, if given the opportunity? Moreover, given that almost all of this part of the population are non-Papuans, what incentive would they have for voting for independence? The cultural and ethnic divide between the Melanesian Papuans and the Austronesian Indonesians is one that can create animosity, given that the Austronesian transmigrants appear to be backed by the Indonesian government at the expense of the indigenous Melanesians. The strategy of large parts of the West Papuan independence movement seems to rely upon calling for a UN overseen referendum on independence. Yet if this was to come about, there seems little guarantee that the vote in favour of independence would be overwhelming, given that a little over half of the population are non-Papuan. This is not to deny the fact that elementary justice should allow some form of fair ballot to take place, to replace the discredited “Act of No-Choice”. In addition to the ethnic division, there is also the religious aspect. The Austronesian transmigrants are overwhelmingly Islamic in religion, and it seems some of them are more strident in defending this than others. The Melanesian Papuans, apparently due to large scale missionary work, appear to be overwhelmingly Christian, which appears to co-exist with their tribal ties. There can be a perception, therefore, that the West Papuan independence movement is backing a Christian West Papua against a Muslim Indonesia. This potentially sets up an unhealthy dynamic in a world political environment where US imperialism has been guilty of deliberately whipping up extreme Islamophobia to generate support for its regime change wars, most recently in Syria. There was an instance where a “Free West Papua Party” turned up to speak at a rally organised by the ultra-racist far-right group Reclaim Australia in Perth. Reportedly, some West Papua independence supporters also turned out to a Reclaim Australia event in Cairns. To its credit, large parts of the Free West Papua movement in Australia issued a statement expressly disassociating itself from the “Free West Papua Party” and from Reclaim Australia. The statement, signed by around 40 representatives of various West Papua independence supporters, rejected the use of racism or religious exclusion entirely, and especially in the case of the struggle for West Papua’s rights. The statement did acknowledge some tension between Christianity and Islam in West Papua, but claimed that this tension has not yet generated into a religious conflict which has broken out in other parts of Indonesia. In our view, the Free West Papua movement needs to be more forthright in declaring that their movement does not attempt to exclude anyone on a religious, cultural or ethnic basis. As in so many class struggles throughout history, the religious aspect is often a cover for very real class struggles bubbling away. This is reflected in the West Papuan divide between the relatively developed coastal cities and towns, and the overwhelmingly rural interior. Austronesian transmigrants predominate in the coastal cities, especially the capital Jayapura, and are the most prevalent in the jobs in the private sector, and those connected with commercial activity. These areas attract higher educated Indonesians, who also dominate in manufacturing, and an estimated 90% of jobs connected with trade. As more transmigrants arrive in the West Papuan cities, they naturally form connections with “their own”, which affords them more job opportunities, which unfortunately crowds out indigenous Papuans. Indigenous Papuans are then often forced back into economic activity such as subsistence farming, which is obviously not as lucrative, and which has little connection to the modern, cash and international economy. This, along with a lack of development in such areas, contributes to a justifiable resentment towards transmigrants, and towards Indonesia in general. While the Indonesian government is spending large amounts of money on West Papua, very little of it reaches the rural interior, overwhelmingly inhabited by indigenous Papuans. This leads to issues such as poorer education outcomes, where apparently 56% of Papuans have less than primary education, and 24% have remained illiterate. The lack of development indicators are stark, as in many rural Papuan interior areas, 80% of villages have no electricity, 90% have no telephone, and 83.5% have no access to banking or credit facilities. Combine this with the fact that around half of Papuan villages are accessible only by dirt road, and one can see how many Papuans might follow the offered “solution” of independence. Perhaps in an effort to divert West Papuans from taking the path of demanding all out independence, the Indonesian government of President Joko Widodo (also known as “Jokowi”) has pledged to accelerate infrastructure development. Last February, the Indonesian government announced it was spending US $371 million on infrastructure and housing in the provinces of Papua and West Papua, including a trans-West Papua highway. The Indonesian government has also prioritised the improvement of facilities at the regional airports at Saigun, Weror Tambrauw, Marinda and Fakfak. Plans for the building and running of a railway in West Papua are also well in the pipeline, with the proposal to run a railway line from the city of Sorong in the West through to Manokwari in the East, passing through South Sorong, Maybrak, Teluk Bintuni, South Manokwari and Manokwari. Electricity infrastructure is also receiving Indonesian government investment. Joko Widodo announced the building of six new electricity infrastructure projects on his fifth visit in October 2016, including 4 hydro-electric power plants, and around 200 kilometres of power lines. Much more would be needed to electrify all of West Papua, but it would seem the Indonesian government is keenly aware of the need for this infrastructure, and the need for it to be NOT seen as only benefiting Jakarta. Of course, all of the infrastructure development in the world is unlikely to completely offset other Papuan grievances, such as the military and political repression that it accompanies. The Indonesian military regard the raising of the West Papuan morning star flag as high treason, and often those who attempt to raise it risk long jail terms if caught. It is also claimed that 500 000 Papuans have perished in skirmishes with the Indonesian military. For their part, the Indonesian military claim they are only responding to an armed insurgency. The Indonesian military are accused of slaughtering pro-independence Papuan fighters, and, in turn, the Indonesian military accuse the Papuan militias of taking non-Papuans hostage. There is also little doubt that the Australian government backs the Indonesian government’s position, and “respects the territorial integrity” of the Indonesian archipelago. After the experience of East Timor, however, many Indonesians simply do not believe such Australian government assertions. Nevertheless, there appears to be strong evidence that Indonesia’s Detachment 88 is trained and supplied by the Australian Federal Police. Detachment 88 are suspected to have been behind the gunning down and murder of Mako Tabuni, who was at the time the deputy chairperson of the National Committee for West Papua (KNPB). In fact, it is not only the Australian Federal Police who “train” and “advise” the Indonesian police, but the police of the United Kingdom, Denmark and Canada. In the case of East Timor in the early 1970s, the Indonesian government and its backers in Australia and the US appeared to be concerned, with some justification, that an independent East Timor would be a communist outpost, a Cuba in the Pacific. The political leadership of the various East Timorese pro-independence groups was certainly left-leaning. However, so far it appears that the politics of the various West Papuan independence groups are not so left wing. Many on the left perhaps understandably believe that an indigenous people fighting for their rights will automatically adopt progressive, anti-capitalist and anti-imperialist politics. This is not usually the case, and in fact, in the absence of a strong trade union movement, or strong left-wing workers’ parties, the politics can often tend towards liberalism – which is a component pillar of capitalism. The Indonesian government is doing what it is doing to West Papua not because it is Indonesian, or because it is predominantly Islamic. The problem is capitalism in Indonesia, including West Papua, and of course including the United States, Australia and New Zealand. This is one reason why independence for West Papua – if this means the setting up of a small capitalist state in the Indonesian archipelago – will scarcely solve the problems that capitalism in the region is responsible for in West Papua – poverty, unemployment and under-development. East Timor is now discovering this, even as we can acknowledge that the Timorese are of course in a better situation without the presence of the Indonesian military. From this distance, it appears that the politics of the various pro-independence West Papuan groups has not developed in an anti-capitalist, much less a socialist direction. Some leftists will point to Lenin’s support for the right of nations to self-determination as justification for endorsing the West Papuan independence movement wholesale. Yet Lenin also always stressed that the interests of socialism and the interests of the socialist revolution take priority over a struggle for national self-determination. That is, working people cannot discount a genuine desire for national self-determination, especially that of a former colonial country. At the same time, nationalism has its own logic. If you wage a campaign on strongly nationalist terms, it often directly leads to recognising the nationalism of all nations – even the huge imperialist powers, which are responsible for your oppression in the first place. The nationalism of a small nation, thus often becomes dependent on larger and stronger patrons. Hence the West Papuan independence movement, as much as it criticises Australian and British government backing of the Indonesian government, at the same time appeals to Australian and British parliamentarians to raise and fight for West Papuan independence within their “corridors of power”. The independence movement, in fact, becomes dependent on the large states it inveigles us to campaign against. Under world capitalism, a small state can barely survive unless it has the backing of very large states. This is why an alternative for West Papua should be a perspective of uniting the working class of all of Papua – non-Papuan and Papuan alike – in a struggle to overthrow capitalism in Papua, Indonesia, and throughout the Asia-Pacific, not the least in Australia and New Zealand. Independence gained in this way would have the potential to address the issues of poverty, unemployment and underdevelopment in West Papua, concern over which is currently being directed towards a movement for (capitalist) independence. This requires the building of Marxist vanguard parties in Papua and Indonesia in the struggle for a socialist Asia-Pacific. As far away as this perspective may appear, nationalism ultimately offers very little for the working people of Papua. It also does not advance the class struggle in neighbouring Australia, where solidarity can end up being an exercise to lobby for concessions from the Australian government – rather than working to delegitimise the ruling class in the eyes of the workers. Nevertheless, it can be recognised that the West Papuan people should have the right to determine their own affairs, if indeed this is what they choose, up to and including the right to secede to form their own state. Such a binding referendum, however, would have to include the entire 3.5 million people who inhabit West Papua, indigenous and non-indigenous alike. Working people internationally should also demand the Indonesian government allow all political activity in West Papua, including that which agitates for independence, to proceed without interference. The flying of the morning star flag should not attract any punishment, let alone jail terms. At the same time, working people should urge the West Papuan independence movement to link with non-Papuans in Papua and Indonesia in a joint struggle against Indonesian capitalism – which is underwritten by its imperialist sponsors. A socialist West Papua as part of an Indonesian workers’ republic would vastly advance the interests of the workers of West Papua, and spur on class struggle throughout the Asia-Pacific. This would be a movement worth fighting for.